November 30 marks 150 years since Sydney’s Cathedral was consecrated by Bishop Barker. St Andrew’s Day in 1868 was an occasion of celebration and dedication – not just because a building had been constructed, but that a centre for gospel ministry could prosper in the heart of the city. The prayer was that God would call people to himself as Christ was proclaimed by those ministering at the Cathedral. Barker closed his sermon at the consecration reflecting on the ministry of St Andrew. He said Andrew “first found his brother and brought him to Jesus. It surely is the proper end of the ministry to bear witness for Christ! For a like purpose this Cathedral is built”. The building of the cathedral was a protracted affair – the consecration taking place in the 50th year after the foundation stone was laid. August 31, 2019 will mark the bicentenary of that gathering of the colony’s dignitaries on land south of the town. Governor Macquarie wanted a cathedral and the paradox of a cathedral without a bishop was not seen as an impediment. As it turned out there wouldn’t be a bishop for 17 years, but this did not hamper the design enthusiasm. Francis Greenway was the architect responsible for the original plans for the site, which included not just a cathedral in Gothic style but a bishop’s residence, a seminary and a library – all of which were intended to form a cloistered quadrangle in the style of an Oxford or Cambridge college. Imagine the Cathedral, Moore College and Bishopscourt all on the same block of land! The walls had hardly emerged from the ground when things stalled, and it wasn’t until Australia’s first bishop arrived in 1836 that there was more impetus. The building was redesigned by Edmund Blacket and things moved slowly forward. When the second bishop, Frederic Barker, arrived in 1855, at his first meeting with the building committee he discovered that the Cathedral was being built on land the church did not own. A diocesan property fiasco was averted as Barker immediately applied for the land, which was fortunately granted by the government. At the building’s consecration Bishop Barker outlined his vision for the ministry of the Cathedral. It was to be “a visible centre of union for the Church at large, where all who will may worship; where the word of God will be faithfully preached; and where the Sacraments of Christ’s appointment will be duly administered”. As noted earlier, his intention was that the ministry of the Cathedral would bear witness to Christ and bring people to him. In other words, the Cathedral was to have evangelism at the heart of all its ministry endeavours. This emphasis on the faithful preaching of the word and evangelism meant that Sydney’s Cathedral ministry was to be conducted in line with the priorities of the Diocese as a whole. 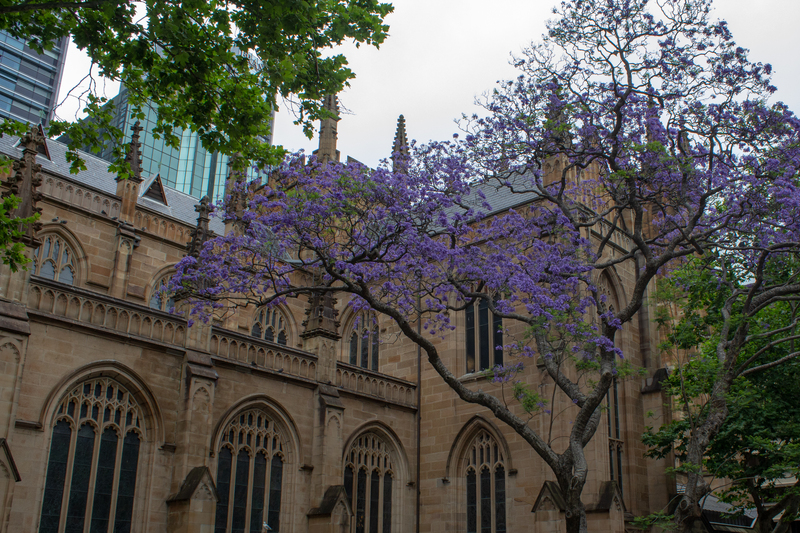 Unlike many other places where there is a large disjunct between Cathedral ministry and parish ministry, in Sydney there has been shared priorities. The first Dean of Sydney was William Macquarie Cowper. He was the son of Archdeacon Cowper and grew up at the rectory of St Philip’s, Sydney. The first dean was also the first Australian-born clergyman and served as the first acting principal when Moore College was founded in 1856. He was widely respected, intellectually gifted and held firm evangelical convictions which made him eminently suitable to be Dean of Sydney. He served in this office for an incredible 44 years and was instrumental in shaping the Cathedral’s character. The ministry of the Cathedral has maintained gospel priorities throughout its history. The location at the heart of the city and next to Town Hall has ensured there have been manifold opportunities to proclaim the salvation that is found only in Christ Jesus. Over the years, those involved in the ministry of the Cathedral have done this both inside and outside the building. On the one hand, significant work has been done to help the marginalised and homeless living in the city while offering them an eternal home. On the other hand, business and community leaders have been evangelised. We should remember that there is a disproportionate number of visitors to the Cathedral compared to parish churches and many who spend much of their working life in its vicinity live some distance away. Moreover, there are particular occasions that are specially afforded to the Cathedral for gospel proclamation due to its civic role. All of this means that over the years the Cathedral has ministered to and evangelised countless people who have gone on to exercise significant ministry in their local parish church or, indeed, in distant countries. There is much to give thanks to God for as the 150th anniversary of the Cathedral’s consecration passes us by. No doubt we are unaware of much of the fruit of this ministry and will not know about until all is revealed on the last day. Nevertheless, we are sure that God’s word is powerful and does not return empty but accomplishes what God desires. As the Cathedral has consistently and innovatively proclaimed the gospel over the years God has been at work. We ought to continue to pray for the Dean and all those involved in the ministry of the Cathedral that they may continue to follow the example of St Andrew’s ministry, “who first found his brother and brought him to Jesus”.